FREE Tri-Coastal 100-Pc. EyeShadow Palette! You are here: Home / Great Deals / Christmas Deals / FREE Tri-Coastal 100-Pc. EyeShadow Palette! Sears has this Tri-Coastal 100-Pc. EyeShadow Palette on sale for $9.98 and you can get back $10.08 in Shop Your Way points, making it FREE! This Simple Pleasures by Tri-Coastal 100-Pc. 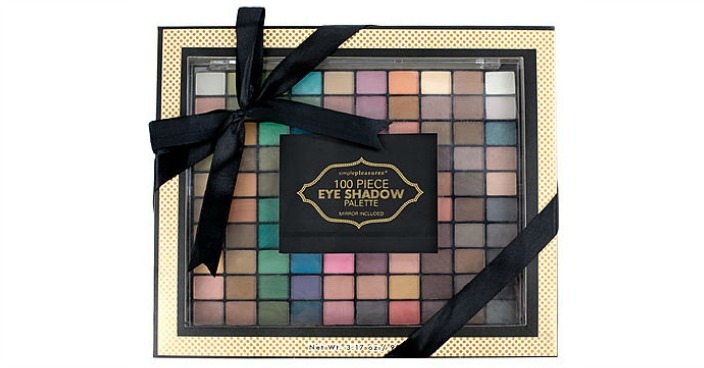 Eye Shadow Palette offers a beautiful choice to match virtually any mood or occasion. Each rich shade goes on smoothly, offering hours of fade-resistant color to accent your eyes, while the attached mirror helps you get the perfect result. You’re sure to appreciate the versatility of this large eye shadow palette.